I love a dish that incapsulates the trifecta of food groups that every dinner I make to contains. That trifecta being: Meat, Vegetable & Starch. In this one dish you’re getting delicious chicken, carrots, celery, peas, onion, garlic, sauce and a crispy melt in your mouth pie crust. 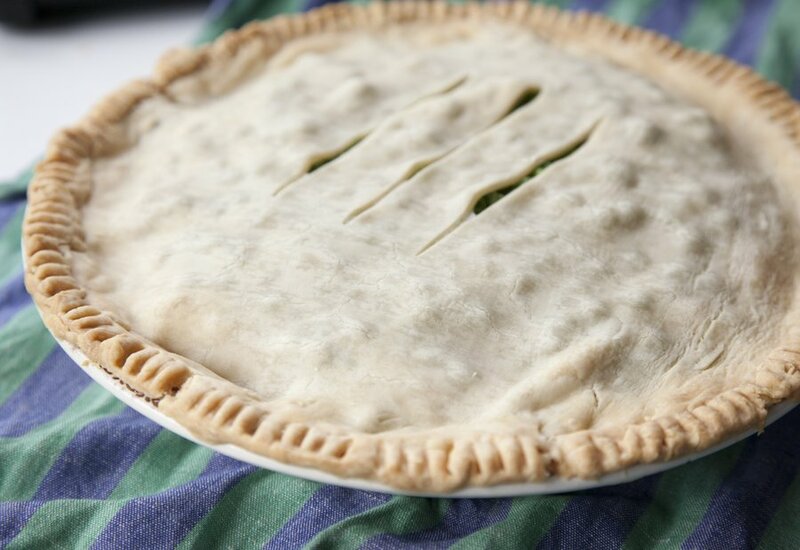 I love Chicken Pot Pies…to me it’s comfort food at it’s finest, and for anyone who knows me, knows my middle name should be ‘comfort food’. The great thing about this dish is you can add/substitute veggies or change up the sauce…..sometimes I make a classic Béchamel, other times, I’ll make a derivative of a Béchamel by adding cheese and making a Mornay Sauce. 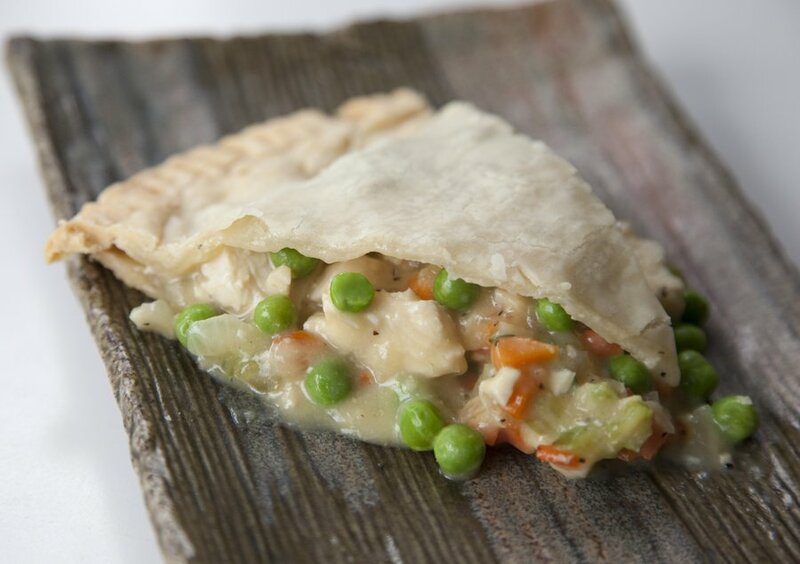 Creamy Chicken Pot Pie with Delicious Veggies and a flakey crust! In a large saute pan, heat up 1 Tablespoon of Canola Oil. Season your Chicken liberally with salt and pepper on both sides. Once the pan is smoking hot, add your chicken. Cook on both sides until cooked through. Remove and let rest for about 10 minutes. Then cut them into little bite sized pieces and reserve. While your pan is still hot, add in your carrot, celery and onion and scrape up all the browned bits from the bottom of the pan. Saute on medium high heat for 5-8 minutes. At this point add in your garlic and saute another 2 minutes. Season with salt and pepper. Turn off the heat and let your veggies sit while you make your sauce. In a saucepan, heat up your butter, once melted add all your flour at once, stirring constantly with a wooden spoon. Cook for about 5 minutes on a medium heat stirring and then slowly add in your chicken stock whisking constantly until it's incorporated. Add in your thyme leaves and milk and let cook over medium heat for 8-10 minutes. Taste and season with salt and pepper. Preheat your oven to 350 degrees. Spray a 9" pie pan with non-stick cooking spray. 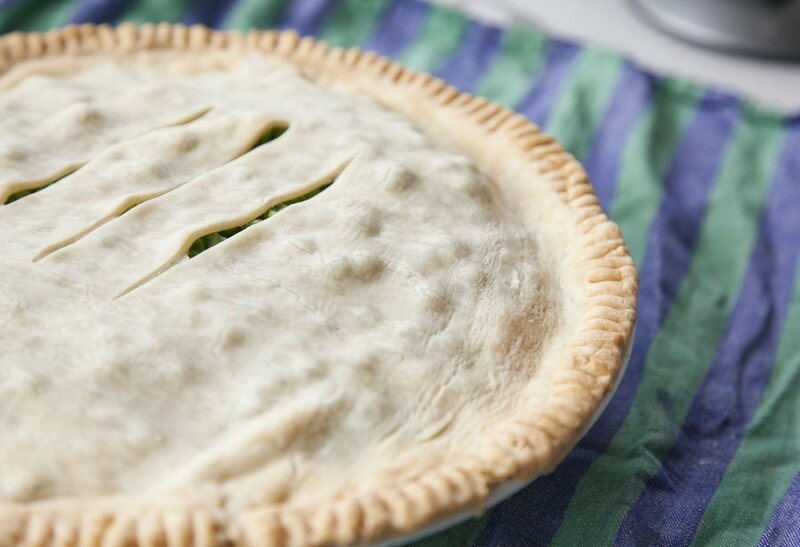 Lay down your first layer of pie crust into the pan. Now take your cut up chicken and add to the skillet with all the veggies in it. Pour the sauce on top and mix together completely. Pour into pie dish. Top with your cup of peas. 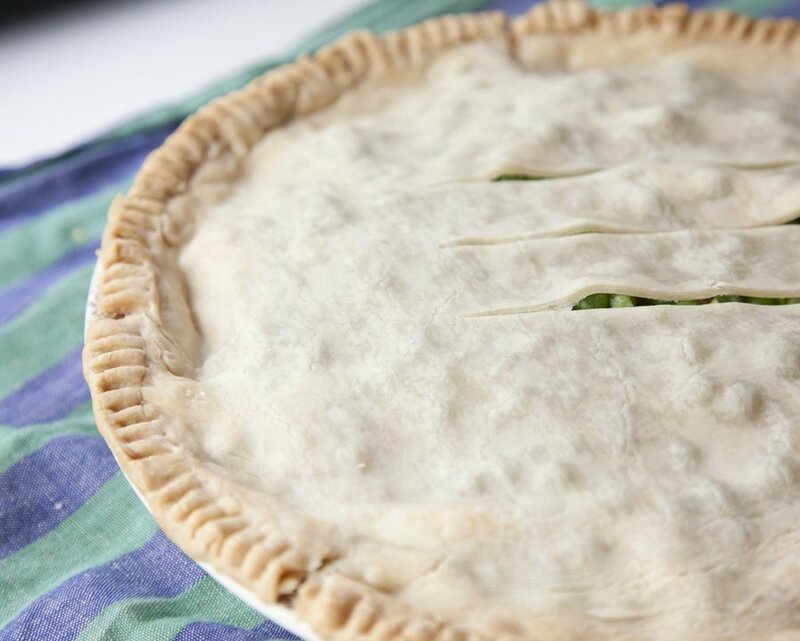 Add your top pie crust on and seal the edges with your fingers. 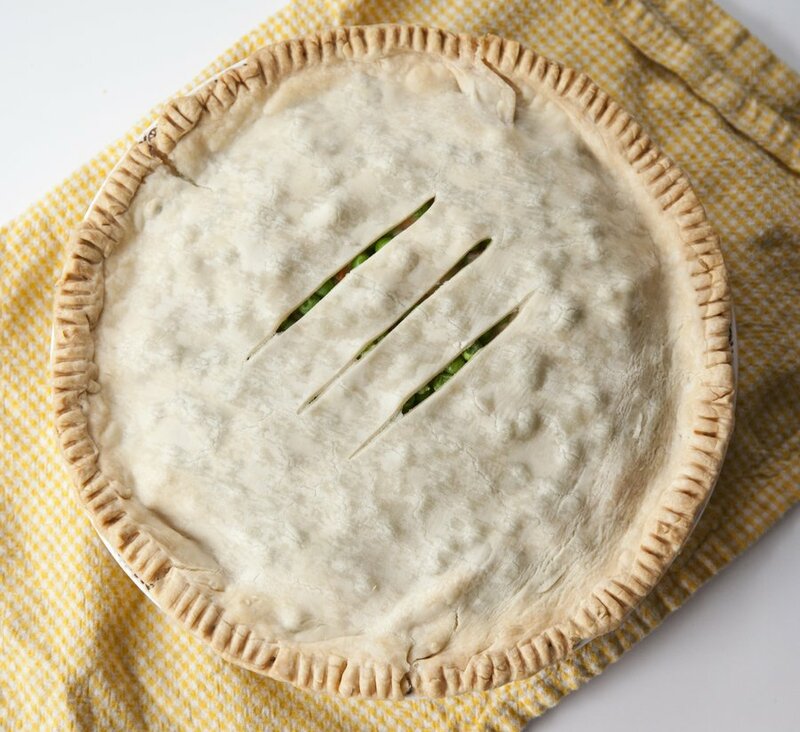 Make sure to cut 3 slits in the top of the pie crust to allow steam to escape. Bake for 40 minutes. Serve hot.